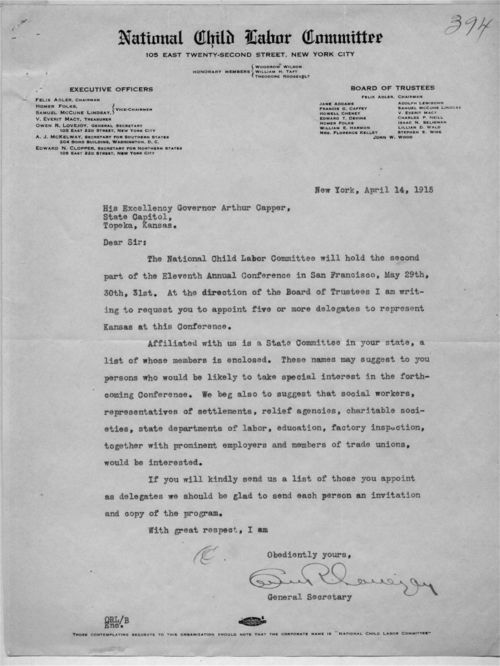 This letter, written by the general secretary of the National Child Labor Committee, refers to the Eleventh Annual Conference on child labor, to be held in San Francisco. Lovejoy enclosed a list of affiliated members in Kansas who may be interested in participating. He also suggested that teachers, social workers, and others who may want to be involved should be informed about this conference. Also attached to the letter is an unsigned reply to Lovejoy's inquiry, presumably written by Governor Capper or his assistant, which lists the names of the Kansans who will be attending this conference. This letter illustrates that Kansas reformers were part of a larger move toward improving child welfare. It also provides the names of the Kansans who were involved with this committee.